(Beyond Pesticides, March 29, 2019) The U.S. Environmental Protection Agency (EPA) made a low-key announcement on March 19 suggesting that it may change its handling of requests from states to exert stricter controls on use of pesticides than the federal agency sets out in its registration of the compounds — by disapproving them. This is potentially a big deal because it signals that the agency will be less-kindly disposed to states’ desires to establish either somewhat different parameters of use based on local conditions and needs, or more-stringent regulations on pesticide use than those set out by federal regulators. This issue of preemption of localities’ desires to protect their populations and environment has become an increasingly dynamic frontier at the nexus of pesticide use, health, and environment. Beyond Pesticides has written more frequently about this issue in recent years as the tension between centralized, federal regulation and more-local regulation has risen; see more below. Some states assign some rulemaking authority over pesticide use to specific state entities, and use that authority to institute additional restrictions on pesticide use. But states do sometimes go to EPA for a 24(c) Special Local Need Label. This is the text of the EPA announcement: “This is the time of year that EPA receives many special local needs registration requests from states under section 24(c) of FIFRA. Section 24(c) states that “A State may provide registration for additional uses of federally registered pesticides formulated for distribution and use within the State to meet special local needs . . .” EPA currently receives approximately 300 24(c) requests annually. Many of these requests are for additional uses not considered by the federal label – e.g., applying the pesticide to a different crop to address an outbreak of disease, adding an alternative application method that suits the practices of that state, or adding a new pest species that is not on the federal label. However, some requests are to narrow the federal label, such as to add a more restrictive cut-off date, to add training and certification requirements, or to restrict the use directions by limiting the number of treatments permitted by the federal label. “Due to the fact that section 24(a) allows states to regulate the use of any federally registered pesticide, and the fact that some states have instead used 24(c) to implement cut-off dates (and/or impose other restrictions), EPA is now re-evaluating its approach to reviewing 24(c) requests and the circumstances under which it will exercise its authority to disapprove those requests. Before making any changes in this regard, EPA intends to take public comment on any potential new approaches before adopting them. The regulation of pesticide use is a multi-variate enterprise; what follows here is a brief primer: EPA is primarily responsible for regulation of pesticides (insecticides, herbicides, and fungicides) under FIFRA (the Federal Insecticide, Fungicide, and Rodenticide Act) and the Food Quality Protection Act (FQPA). The EPA looks at what potential human health and environmental impacts might be associated with use of a pesticide. It is supposed to do so by evaluating — on the basis of scientific studies that investigate the matter — whether compounds proposed for use may cause adverse effects on humans or the environment. It is charged with approving only those that cause “no unreasonable adverse effects, taking into account the risks and benefits of pesticide use.” (This, of course, begs the question: what are “reasonable” adverse effects?) In its evaluations, the agency also uses the National Research Council’s four-step process for human health risk assessment, which includes: (1) hazard identification, (2) dose-response assessment, (3) exposure assessment, and (4) risk characterization. If a pesticide meets the “no unreasonable adverse effects” requirements, it can be “registered,” which means approved, for use within prescribed limits and parameters. When registered, a pesticide acquires its “federal label,” which sets out the requirements for, and limitations on, its use. In addition, pesticides are assigned a Toxicity Class, based on their acute toxicity; these include: Categories I (highly toxic and severely irritating), II (moderately toxic and moderately irritating), III (slightly toxic and slightly irritating), and IV (practically nontoxic and not an irritant). “Signal words” must be used on the labels of categories I–III and are, respectively, “Danger,” “Warning,” and “Caution.” Once registered, pesticides must be reviewed every 15 years to ensure that they continue to meet these requirements. Federal regulation of pesticide use has increasingly been challenged by localities, whether states, counties, cities, or towns — often with the advocacy of community and nonprofit groups — seeking greater levels of protection for residents and/or the local environment. Localities will establish stricter regulations, and nearly inevitably, pre-emption — the ability of a “higher” level of government to override laws of a lower level — becomes an issue. Pre-emption happens not only from the federal to state level; states often act to pre-empt county and municipal attempts to enact more-protective local regulation. Typically, a state, often spurred by complaints from trade associations or individual companies in the agrochemical industry, will litigate with the goal of state pre-emption of a local statute that seeks to rein in pesticide use in some way. POLITICO’s reporting notes that the greatest near-term impact of this signaled change in EPA’s responses to 24(c) requests might be the significant state regulation of dicamba, the Monsanto/BASF herbicide product that was formulated and marketed to deal with weeds that have developed resistance to the glyphosate-based Roundup. 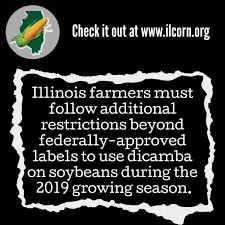 Dicamba, which is commonly used on soybean crops through the Midwest and South, has been the subject of great concern for the damage it causes to crops from drift, as well as for its health and environmental impacts. A number of states, including Indiana, Minnesota, Missouri, South Dakota, North Dakota, Illinois, and Arkansas, have instituted restrictions on its use that surpass those accompanying the federal registration of the compound. Texas, Iowa, Georgia, Kentucky, Alabama, and North Carolina are all eyeing 24(c) requests for tighter application windows, additional training requirements, better record keeping, new fine structures for violations, and other modifications of the federal label. Arkansas banned dicamba use entirely in early 2018; that ban was upheld in the face of Monsanto’s lawsuit challenging it. Then, in November 2018, EPA stepped in to rule that the herbicide could be used in the state for two years, superseding the state ban. Such experiences with EPA around use of dicamba may be a harbinger of what is to come. Stay current on these issues through the Beyond Pesticides Daily News Blog, check out advocacy activity in any state, and join Beyond Pesticides in pushing for the local authority to create more-robust protections from pesticide use. This entry was posted on Friday, March 29th, 2019 at 12:00 am	and is filed under Environmental Protection Agency (EPA), Preemption, Uncategorized. You can follow any responses to this entry through the RSS 2.0 feed. You can skip to the end and leave a response. Pinging is currently not allowed.